Congrats to Laura (MLIS ’19) from everyone at SIM! More information about SIM’s awards and scholarships can be found here. 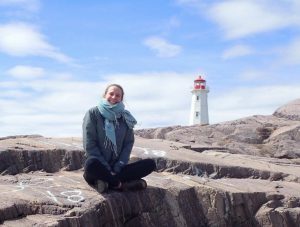 When Stephanie Downs returned to Canada from the UK to become a librarian, she chose to enter the MLIS program at Dalhousie for its sense of community, welcoming faculty and Maritime culture. Diagnosed with cervical cancer at the end of her last year at SIM, Stephanie graduated with her MLIS but lost her hard-fought battle to her illness on May 27th, 2007. Remembered for her enthusiasm, Stephanie was a “doer” and very active in school life, serving as 2005-2006 Co-Chair of SIMSA and SIM Team Captain for the 2005 Halifax “Run for the Cure”. She was also awarded the Student-to-CLA travel award to attend the 2005 CLA Conference in Calgary. This award was established by Stephanie’s family and friends in her memory. Originally from Moncton, N.B., Laura Little is an energetic and passionate information professional aiming to complete her MLIS at Dalhousie’s School of Information Management by June 2019. After completing her undergraduate studies at Dalhousie with a unique combined Bachelor of Science degree with Honours in Biology and the History of Science & Technology, she was bound for a dynamic career. She began working at the University of King’s College Library and Archives during her undergraduate studies, then moved to Toronto and worked in corporate records management, and part time at the public library in a diverse west-end neighborhood. All the while, she volunteered with a variety of groups including the Canadian Lesbian & Gay Archives and The Ryerson Star Spot Podcast. Inspired by the diversity of cultures and languages in Toronto, she moved to Madrid to teach English and learn Spanish. She fell in love with teaching, and continues to do so as a Teaching Assistant for Professional Communication Skills, and throughout the course of her University Teaching Certificate at Dalhousie. As a Dalhousie Libraries intern, she excels at programming, designing educational resources and providing reference and research assistance. She hopes to encourage and inspire students to reach their full potential. She’s continued her extracurricular enthusiasm as the Information Without Borders Programming Co-Chair. She is passionate about good communication while building and maintaining relationships. She considers herself an interactional learner, and loves playing basketball and climbing with her classmates. If you see her hustling around campus, she’ll give you a huge smile and talk your ear off. Laura’s mother and I are so proud of our daughter and on behalf of the whole family pass along our congrats to Laura and thanks to Dalhousie for the recognition. Sisters Kris, Karen and Allyson and brother David know she will be successful in the future in everything she tackles. Wonderful! Congratulations Laura reach for the stars!! Very proud of you!! Congratulations Laura! Wishing you all the best in your future endeavours! Congratulations Laura! Wowee..! We are proud of you!